Twilight, Ender’s Game, The Hunger Games, The Host, what do all of these flicks have in common? They are all based on a young adult series of books, along with Divergent, and just like the rest, I haven’t read the book, but I might end up doing that just to see how things were handled differently in novel format. I’ve seen enough of these flicks to get an idea of how they are going to play out, with a bit of wishy-washy melodramatic tones you might find on a typical show on The CW, but if you give these films a chance, they usually have the ability to surprise you with a decent premise. 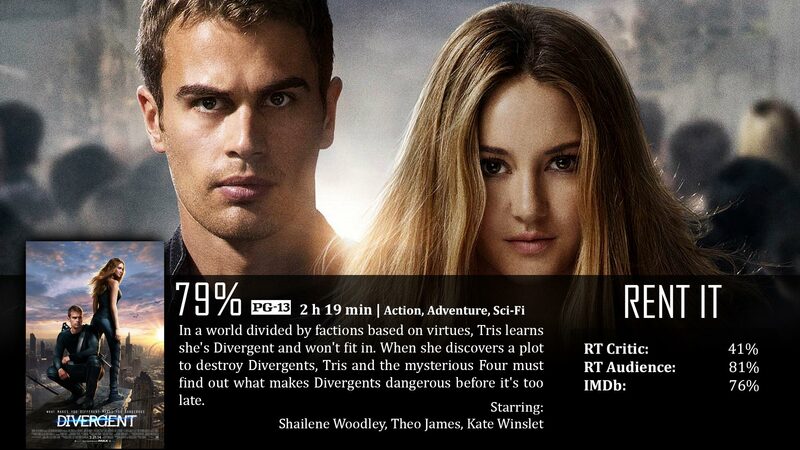 Divergent had a decent premise, but how does it work for everyone else who isn’t a tween? Well let’s take a look at the story, because it can be a little confusing, given the dystopian setting. Basically, there are five jobs that people are born into and then when they hit a certain age, they are given an aptitude test that suggests the proper job for them in the “choosing” ceremony. When Tris (Shailene Woodley) takes this test, it proves that she is in fact a “Divergent”, meaning she hits the mark for every one of the jobs – something that rarely happens. However, the government is killing off Divergents, so she must keep this fact hidden from everyone else while she joins Dauntless, the job of the protectors. This film basically covers the training stage, what it takes to be a true Dauntless while trying to keep a deadly secret. So the story itself is very unique, very dystopian, maybe even hard to follow for an audience that is a bit younger, but it’s still pretty cool all around, because these are basically characters that aren’t hard to like. I don’t exactly love these characters as much as what they probably want you to, but you can connect with a majority of the characters enough to feel what they are going through, while the corruption of the government is exposed. I can’t exactly say how it fits in with the book or how factual it is, but it has a very solid story and it goes through the motions of making sure everything is understood. Like I said, it does have that floozy CW, melodramatic mumbo jumbo that it was honestly bound to have eventually, but what’s nice is the film looks really cool. It’s set in Chicago, but a very different looking Chicago with a tall and mysterious fence keeping something out. Now, the exploration of things outside of Chicago is probably set for the sequels, and this is a film building up to that, but as a standalone plot, it’s actually pretty decent. Yeah I was in a theater full of teens and girls, but that’s the target audience, and I’m fine with that, because I didn’t feel as much as a stranger as I thought I might. As far as the acting goes, it wasn’t super special. I’m a fan of Woodley’s very limited career, it’s not her acting in the film that I have a problem with. She was actually considered to play Katniss in The Hunger Games. I mostly have a problem with the acting of some of her co-stars. I didn’t really sense a romantic chemistry between herself and Theo James’s character, Four, which is pretty important. Other characters I was annoyed with, some didn’t fit very well, I think Woodley was a fine actress, but no one did phenomenally. I think in order for any film to be successful, the acting by someone has to be amazing, and I can’t say that here. However, it’s still a fun decent flick. People are going to be easy to dismiss this flick, but it’s not as bad as some people put it out to be. The dystopian tone to this film as well as the unique premise is enough to at least gain an interested eye. It definitely works for its target audience. As I mentioned a couple times, Divergent feels a little too floozy melodramatic at times, like a show on The CW. The acting is never phenomenal, and all of that takes away from what could have been pretty darn good. I think I’ve about had it with all of these damn YA novel adaptations. Seriously. Good review Dave.